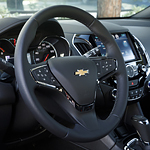 You can stay connected in your Cruze with the built-in infotainment system, smartphone integration and the latest technology allowing you to enjoy your favorite entertainment apps for your longer rides. Want a closer look? Visit us today at Lochmandy Motors and take the new Cruze for a test drive. We can't wait for your to see the excellent style and design of Cruze for yourself.